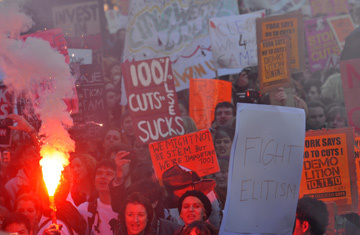 Britain's Student Riots: A Sign of Things to Come? It is almost a tradition in Britain that, at the first sign of industrial unrest or anti-government protest, headline writers dust off that old favorite, the "winter of discontent" quote. Those three words from Shakespeare's Richard III were originally meant to conjure up images of a malevolent King raging against a cruel world. But since the British press borrowed the phrase to refer to the nationwide outbreak of strikes that helped destroy a Labour government in the winter of 1978-9, it now instead recalls pictures of uncollected refuse filling town squares, nurses on picket lines, the dead going unburied and an administration under siege. It is surprising, then, that the "winter of discontent" banner has not been more widely used in the wake of Wednesday's student march, which began with 50,000 people protesting peacefully in London against government plans to increase annual tuition fees almost three-fold to £9,000 ($15,000), but quickly turned violent and ended with the ruling Conservative party's HQ trashed by rioters. All the ingredients appear to be in place for a winter  and possibly even spring and summer  of unrest, as British students, workers and families start feeling the effects of the massive £82 billion ($148 billion) worth of cuts to public spending announced by the coalition government last month. There has already been a rash of strikes by subway train operators and firefighters, and trade-union leaders have been warning of more ahead, with some of the most militant talking in terms of national stoppages. Even finance minister George Osborne predicted at the time of his austerity announcement that the government would quickly become hugely unpopular because of the scale of the cuts needed to pay down the country's deficit. And then there's the lesson from across the Channel, where French students and unions have staged mass, often violent, protests against plans to increase the pension age  a seemingly trivial complaint compared to the pain about to be inflicted on the Brits through cuts expected to hit just about every family in the land. When the French first began their protests in September, the question being asked by the British media was: "Why don't we riot as easily as the French?" On Wednesday they got the answer: "We can." In scenes reminiscent of the riots that hit central London in 1990 after Margaret Thatcher's government attempted to radically reform local taxation  and which helped end both the policy and her premiership  students took to the streets en masse. But the violence that erupted on Wednesday, leading to 50 arrests and at least 41 injuries among police and protesters, not only distracted from the protesters' message, it also highlighted one of the many reasons legislators believe there will be no winter of discontent this time around. It quickly became clear that the protest had been hijacked by anarchists and other groups, well versed in the art of troublemaking, who always turn up at demonstrations in an attempt to turn them into anti-capitalist rallies. "They came with flares," said one protester, biomedical science student Rowenna, 21, on Wednesday. "It must have been preplanned. You don't just have flares in your pocket." But another student (who asked not to be identified) noted that, while there may have been a few extremists, hundreds of others were willing to join in the attack on Millbank Tower, the Tory base. "There were a few leading the charge, but plenty of us ordinary students were joining in as well and we're not all anarchists," he says. "We are very, very angry about the tuition fees and we wanted to be heard." Yet student union leader Aaron Porter contended that the violence had only succeeded in losing public support for the students. Meanwhile, people are still waiting to see just how the austerity measures are going to hit them personally. It may be that they decide to rally around the students as the symbol of their own anger  but so far there's been no indication that they will. The troublemaking element of Wednesday's demonstration may give politicians an excuse not to address the challenges presented by otherwise legitimate protests, but there are other powerful reasons why there is a reluctance to see this riot as the beginning of something bigger. Despite the saber rattling, most union leaders are not inclined to call for general strikes or mass pickets. They are so constrained by legislation drawn up since 1979's show of strength that they have little room for maneuver. Unions need a majority of their members to back strike action in a secret ballot, and even small technicalities can be used to take the result through the courts and stop action in its tracks. Plus, employees have to give their bosses seven days' notice of action. Flying pickets  when members of one industry or union join picket lines staged by members of another  have also been outlawed, making mass protests around a single industry's dispute illegal. Today's union leaders are, as a rule, far more concerned with negotiation than confrontation, believing that history has taught them some hard lessons about conflict. "This isn't 1979 or even 1990," says a senior Labour aide. "The unions have lost much of their power and, so far, there's no sign of a great public upsurge against the cuts. Although it is possible that might change when things get really tough." And then there is the example of France. Despite it all, President Nicolas Sarkozy's move to increase pension age has become law. The protests failed. See pictures of Britain going to the polls. See inside the world of David Cameron.